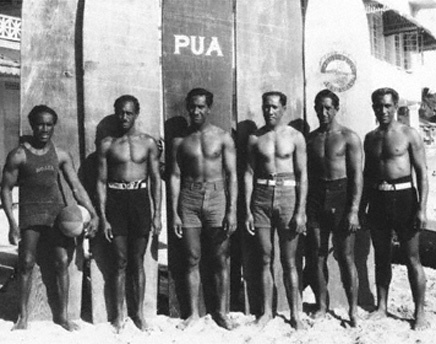 By the turn of the 20th Century, surfing had all but disappeared in the Hawaiian Islands. 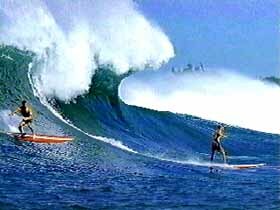 Most of the surfing took place at Kalehuawehe on the south shore of Oahu, with a few surfers at spots on Maui, Kauai and the other islands. Honolulu had become Hawai'i's largest city with one out of every four Hawaiians living there, but surfing on the reefs where hundreds had once cavorted was now a rarity. There are some famous photos from the early 1900s of native men wearing loincloths, with Diamond Head and little else in the background. These were solitary men, most likely posing for the camera, standing alone where at one time hundreds had surfed. Ironically, it was three haole who were instrumental in the rebirth of surfing in the Hawaiian islands, and it was a fourth man, a native Hawaiian, who was instrumental in pollinating surfing around the world. This article has several pages... please use the page numbers at the top and bottom of the article to navigate! In 1907, Jack London came to Hawai'i as a literary lion, having already published three best-selling adventure novels: The Call of the Wild, The Sea-Wolf and White Fang. 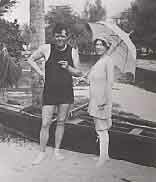 London and his wife Charmian were celebrities when they came to Waikiki in 1907 and stayed on the beach where the Moana Hotel now stands. There were a few surfers on the beach at Waikiki at that time, a loose clique of Hawaiians and part-Hawaiians who formed a club called the Waikiki Swimming Club. London met that crew and was introduced to the joy of surfing by Alexander Hume Ford, an eccentric journalist and wanderer. Ford took London surfing, and there London met the most celebrated Waikiki beach boy of the time, a 23-year-old Irish/Hawaiian named George Freeth. London was a renowned writer, Ford a habitual organizer and Freeth a great waterman. What they had in common was a love of surfing, and their combined talents breathed life into a dying, beautiful sport -- the Sport of Kings. 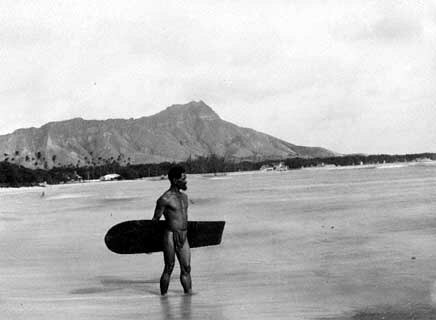 In 1907 London wrote A Royal Sport: Surfing in Waikiki, which included descriptions of Waikiki and Alexander Hume Ford. His story was published in the October, 1907 edition of The Lady's Home Companion and again in 1911 as part of The Cruise of the Snark. "Where but the moment before was only the wide desolation and invincible roar, is now a man, erect, full statured, not-struggling frantically in that wild movement, not buried and crushed and buffeted by those mighty monsters, but standing above them all, calm and superb, poised on the giddy summit, his feet buried in the churning foam, the salt smoke rising to his knees, and all the rest of him in the free air and flashing sunlight, and he is flying through the air, flying forward, flying fast as the surge on which he stands. He is a Mercury-a brown Mercury. His heels are winged, and in them is the swiftness of the sea." One of the boys riding upon the crests of waves was George Freeth, whom London encountered during surf sessions with Alexander Hume Ford. London described Freeth glowingly, "I saw him tearing in on the back of [a wave] standing upright with his board, carelessly poised, a young god bronzed with sunburn." London's celebrity and power was such that in 1907, Freeth was invited to California by railroad and real estate magnate Henry Huntington. Freeth was asked to put on a demonstration of wave-riding in southern California to promote the Redondo-Los Angeles Railway. Freeth accepted the invitation and earned the title of The First Man to Surf in California. However, that title wasn't exactly true. As early as 1885, three Hawaiian princes visiting Santa Cruz, California from a military academy in San Mateo were reported to have ridden waves at the San Lorenzo Rivermouth on boards shaped from local redwood. Earlier than that, in Two Years Before the Mast, Richard Henry Dana described Hawaiian crews on sailing vessels along the California coast in 1835. Dana tells one story of the Hawaiians gliding through a Santa Barbara shorebreak in their longboat without a hitch, then laughing from shore as the haole boat crew of easterners failed miserably at the same landing. You have to wonder about the Hawaiian boat crews in California in the early 1800s and throughout the century. A surfer is a surfer and a wave is a wave. It's hard to imagine anyone who has ridden a wave passing perfect Rincon or Malibu and not stopping to catch a few. Who knows how many surfers rode waves in California, but the Hawaiian princes were the first to be recorded and George Freeth was the first to become famous as a surfer. While London was writing about surfing and Freeth was surfing in front of astonished crowds, Alexander Hume Ford was campaigning on behalf of surfing. In 1908, Ford petitioned the trustees of the Queen Emma Estate to set aside a plot of land next to Waikiki's Moana Hotel for a club that would preserve the ancient Hawaiian pursuits of surfing and outrigger canoeing. Hume Ford's fund-raising manifesto described a club that would "give an added and permanent attraction to Hawai'i and make Waikiki always the Home of the Surfer, with perhaps an annual Surfboard and Outrigger Canoe Carnival which will do much to spread abroad the attractions of Hawai'i, the only islands in the world where men and boys ride upright upon the crests of waves." Ford presented the manifesto to the trustees of the Queen Emma Estate, and they accepted it. On May 1, 1908 they founded the Hawaiian Outrigger Canoe Club, the first modern club dedicated to the perpetuation of wave-riding. The club offered facilities for dressing and a grass hut for board storage right on the beach. In 1905, the native Hawaiians began the informal Hui Nalu (surf club), revitalizing native Hawaiian interest in the sport. The Hui Nalu and the Outrigger Canoe Club began friendly competitions, and by 1911 when the Hui Nalu was formalized there were as many as one hundred surfboards on the beach at Waikiki. In 1915 Jack London returned to Hawai'i and was shocked and excited to find the Outrigger Canoe Club had 1200 members, "with hundreds more on the waiting list, and with what seems like half a mile of surfboard lockers." In 1912, Hawaiian beach boy Duke Paoa Kahanamoku was already famous as a surfer and swimmer. 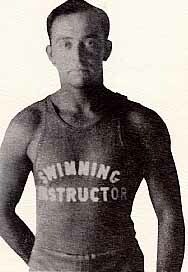 He was credited with developing the flutter kick to replace the scissor kick in freestyle swimming and was the three-time world record holder in the 100-meter freestyle. 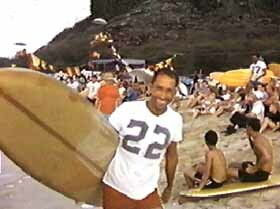 As a surfer, Duke was one of Hawai'i's best ocean watermen, a beach boy and one of the founders of the Hui Nalu Club. Duke was a fine figure of a Polynesian, slim and muscular and built for speed, blessed with extraordinarily long hands and feet. In 1912, Duke passed through southern California en route to the summer Olympics in Stockholm, Sweden. 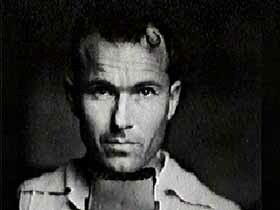 His surfing demonstrations at Corona del Mar and Santa Monica caused a sensation much greater than Freeth's. Duke became world famous by winning an Olympic gold medal in the 100-meter freestyle in Stockholm and again in Antwerp in 1916. Touted as the fastest swimmer alive, Duke was on the road constantly, giving swimming exhibitions around Europe, the United States and the world. He also became a favorite of Hollywood casting directors, playing Aztec chiefs, Hindu thiefs and Arab princes. On weekends he would take his Hollywood friends surfing, and everywhere he could, Duke used his fame to introduce the world to the sport of surfing. In 1915, Duke was invited by the New South Wales Swimming Association to give a swimming exhibition at the Domain Baths in Sydney. Australians were vaguely aware of surfing at the time, and the ocean-crazed people were thrilled when Duke fashioned an 8' 6" alaia board out of native Australian sugar pine. Duke rode the board at Freshwater Beach in Manly in February of 1915 and singlehandedly put Australia on a path to superpower status in the surfing world. Duke was a busy man into the '20s, competing in the 1920 and 1924 Olympics, hobnobbing in Hollywood and spreading surfing to the world. Back home in Hawai'i in the summer of 1917, Duke rode a now legendary wave at Kalehuawehe, which was now called Outside Castles. He caught a wave that took him well over a thousand yards, from all the way outside Castles, through Elk's Club, Cunha's and Queen's and all the way to the beach. This was a wave and a feat that has never been matched, and another boost for Duke's enduring legend. After George Freeth in 1907 and Duke Kahanamoku through the 1920s, the population of surfers in California grew slowly. 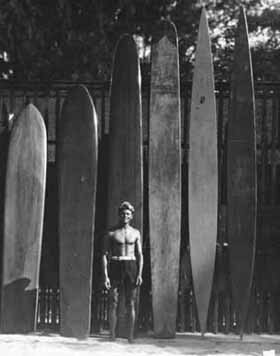 Surfboards were mostly made of heavy and unwieldy redwoods and hardwoods with designs adapted from Hawaiian shapes to fit California conditions. By 1928, a Wisconsin-born man named Tom Blake organized the Pacific Coast Surfriding Championships at Corona del Mar. Top surfers from all over California competed for the Tom Blake Trophy from 1928 to 1941, when World War II put an end to the event. Blake was also the first photographer to shoot surfing from the water. One of the first southern California men who became enamored with surfing in the '20s and '30s was John H. "Doc" Ball, a swimmer and dentist who grew up near Hermosa Beach, and struggled with the heavy, redwood surfboards until he developed the strength and agility to handle them. Doc Ball got hooked by surfing as seriously as any man ever has, finding it "a great stress reliever" to be away from the close confines and pain of the dentist's chair. Doc Ball was also fascinated by photography and he became the first Californian to go about seriously documenting the surfing lifestyle as it existed before, during and after World War II. He was the second surf photographer, after Tom Blake, to photograph surfing from the water with a waterproof camera housing. 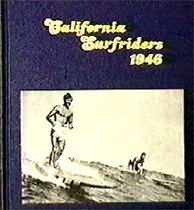 Doc Ball's classic photo book, California Surfriders 1946 is a masterpiece of the time, showing sturdy men and women enjoying a nearly pristine California coast from La Jolla to Santa Barbara, and on up to Santa Cruz and Pacifica: beach parties with fresh lobster and abalone pulled from the ocean, hardly any traffic along the coast highway and a California coast that was still open and undeveloped. It's enough to make a resident of the 21st century long for the good old days. Doc Ball became best friends with surfer LeRoy Grannis, and passed the mantle of surf photography to him in 1960. Grannis (known to his friends as "Granny") continued Doc's tradition of documenting the California (and then Hawai'i) surfing scenes with high quality photography. Grannis became the founding photographer of Surfing Magazine in the early '60s. Although World War II curtailed much of the surfing activity in California and Hawai'i, it exposed tens of thousands of men to Hawai'i, to the Pacific Ocean, and to "the Sport of Kings." Woodbridge Parker "Woody" Brown was one of these men. The son of an upper-class New York family, Brown was more interested in freedom and flying than "big-shot money deals." He learned to fly alongside Charles Lindbergh in Long Island, New York, and soon became a world-record holding glider pilot. While living in San Diego, Woody took up surfing and helped to establish the Torry Pines Glider Port, which still stands today. 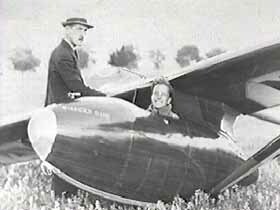 In 1939, Woody became a national flying hero when he set world gliding records for both altitude and distance. But his triumph was followed by tragedy when his wife died in childbirth soon after he returned home to San Diego. Brown was devastated and fled to the South Pacific to try and get away from his grief. He toured the islands on a bicycle, a lost soul partially healed by the Aloha spirit he found everywhere. After wandering the islands, Brown settled on the beach at Waikiki where he immersed himself in the ocean lifestyle: surfing, swimming, and sailing. He applied his knowledge of aerodynamics to the hydrodynamics of surfboard design and he also invented and built the first modern catamaran. Brown married a local Hawaiian woman, embraced Hawaiian music and culture and was adopted by Hawaiians as one of their own. When Woody and Rachel "Ma" Brown were first married, they lived atop the Waikiki Tavern in the heart of Waikiki Beach, still a semi-paradise before the hotels and the tourists arrived. 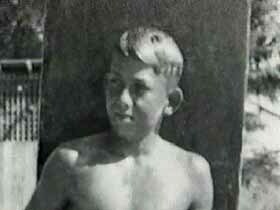 One of the leading beach boys of Waikiki at the time was a handsome local Hawaiian named Rabbit Kekai. Rabbit ruled Waikiki as a surfer, beach boy, canoe paddler, prankster and lady's man. Rabbit had been mentored by Duke Kahanamoku and many considered him the Hawaiian Ambassador of Aloha after the Duke. Rabbit Kekai was (and is) a great small-wave surfer and is credited with innovating high-performance "hot dog" surfing in the smaller waves of Waikiki and Makaha. Woody was more interested in the big waves and he was one of the pioneers of surfing really big surf along the south shore of Oahu, at Makaha and on the North Shore of Oahu. There weren't a lot of takers for the big 25-foot waves throughout the '30s and '40s, but John Kelly was one of them. Kelly was haole, a transplant from California to Hawai'i who fell in love with Hawaiian ways, from net-fishing in the shorebreak to riding the giant bluebirds of Waikiki. 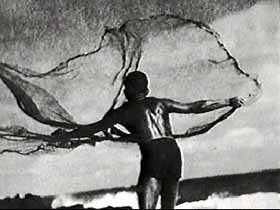 His parents were artists who loved Hawai'i and its people, and Kelly grew up during the '20s and '30s poor but not underprivileged. He surfed, he fished and he learned to respect nature and life, in the Hawaiian way. His lifelong environmental activism was born in the mentoring he received from Hawaiians in "Aloha 'aina, Aloha kai"-"love the land, love the sea, and only take what you need." In 1961, he founded the seminal surfer's environmental organization, Save Our Surf, which successfully organized to block over 35 major coastal development which threatened the surf zones. John Kelly, Rabbit Kekai and Woody Brown knew each other and surfed together in the blissful Hawai'i of the '30s, '40s and '50s, when places like Makaha and Sunset Beach were first being surfed, and changes in materials were making surfboards lighter, faster, stronger and more maneuverable. In 1953, an Associated Press photo of Woody Brown and two other men streaking across a giant wave at Makaha appeared in newspapers in California and throughout the world. Surfing was beginning to boom in California at the time, with surf clubs all up and down the coast, from Santa Cruz to La Jolla. Surfers were still riding relatively heavy balsa and redwood surfboards, and innovations like wetsuits and surf leashes didn't yet exist. The photo of Brown and his friends streaking that Makaha wall galvanized a large group of surfers who began an exodus to Hawai'i from California (and other states like Texas), and the modern history of surfing began in the late 1950s. 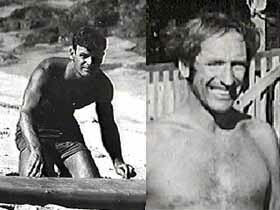 Fred van Dyke and Peter Cole were two of the California surfers lured to Hawai'i by the siren call of that Makaha wave. 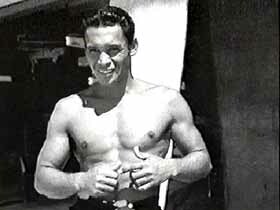 Van Dyke was a San Francisco native, born in 1930, who learned to surf at Santa Cruz when he was 20. Cole was a lifeguard and surfer from Santa Monica. They met while surfing in Santa Cruz, when Cole was a student at Stanford and Van Dyke was teaching in the Santa Cruz Mountains. Van Dyke was in the teacher's lounge when he saw that famous Makaha newspaper photo. He quit his job the next day, moved to Hawai'i, and was instrumental in luring Cole and several others to follow him. 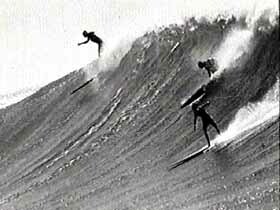 Cole and Van Dyke were two of the leading big-wave surfers of the '50s and into the '60s, members of an elite group of Hawaiians and haole who challenged the giant surf at Makaha, Sunset Beach and, later, Waimea Bay. The great Hawaiian surfers of the era included Eddie Aikau and Buffalo Keaulana. Unlike most surfers at the time, who scraped by through the winter on money scrounged from summer jobs, Cole and Van Dyke had teaching credentials and took positions at the prestigious Punahou School in Honolulu. Cole and Van Dyke became known as the surfing teachers, and were occasionally rumored to be absent from staff meetings when the surf was smoking on the other sides of the islands. Cole and Van Dyke became famous surfers as surfing emerged from the shadows of obscurity and into the mainstream culture during the late '50s and early '60s. 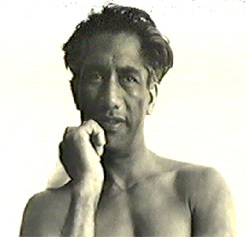 Beginning with filmmaker, Bud Browne, a southern Californian who pioneered the surf movie in the mid-'50s, more and more photographers, cinematographers, musicians and journalists became fascinated with surfing, and what began as a novelty exploded into a full-fledged industry in the '60s. Unlike in ancient Hawai'i, surfing in the '50s and '60s was primarily a male- dominated sport. In spite of this, Eve Fletcher and Anona Napoleon were two adventurous and pioneering women who challenged the surf alongside the men. Fletcher was a pretty, petite California girl who liked to hang out and surf at San Onofre when she wasn't working as an animator for Walt Disney. 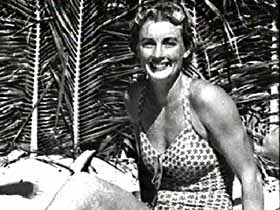 Lured across the ocean like the men, she flew to Hawai'i in the '50s with her friend and surfing mentor, Marge Calhoun. They bought a panel truck from Fred van Dyke and had the time of their lives living in it "on surfari" throughout Oahu. 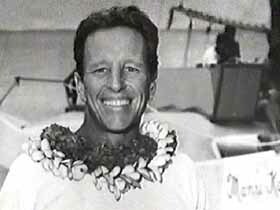 Calhoun won the prestigious Makaha International Surfing Championships that year, 1958, when Peter Cole was the men's winner. Another woman surfing in Hawai'i at the time was Anona Napoleon, the daughter of a celebrated Hawaiian surfing family who inherited the Hawaiian talent for canoe racing and riding waves. Napoleon was a world-class competitor in both surfing and kayaking who was temporarily paralyzed in a diving accident, but her competitive spirit and indomitable spirit enabled a miracle recovery. 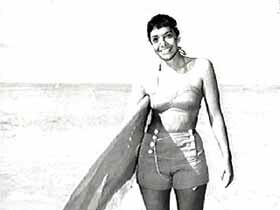 A year after her accident, in 1961, she won the women's division of the Makaha International Surfing Championships.